HELSINKI – April 25, 2019 – Karsa Oy, developer and manufacturer of chemical threat detectors for security applications, has reached the minimum level during a funding round by investment house Springvest Oy. Karsa Oy started working with Springvest Oy in January 2019 and by April 8, 2019 the funding round was live with a target of 1.1-2.1M€ to be raised. Yesterday, the minimum was reached, and the round is progressing rapidly (see below for live update). The funding will enable Karsa to accelerate the productization of the ScentHound and to prepare the international launch activities. Karsa Oy is developing explosives detection equipment with high sensitivity and specificity to provide dramatically increased explosives detection capabilities at lower costs than current technologies. Bringing this technology to the global market place is expected to transform the security industry with options that will raise the level of security in markets including civil aviation, beginning with air cargo screening. Karsa’s technology also has application for customs and border protection as well as emergency management. Karsa Oy was founded in 2016 by a team of sampling and detection experts from the University of Helsinki, international industry partners and Lifeline Ventures, the leading venture capital investor in Finland, and with the support of Business Finland, Finnish Funding Agency for Innovation. Below you can find a live update on the progress. HELSINKI – January 9, 2019 – Karsa Oy, commercialising chemical ionisation(CI) technology originally developed at the University of Helsinki for security applications, today announced the addition of aviation industry expert, Mark Laustra, to its board of directors. 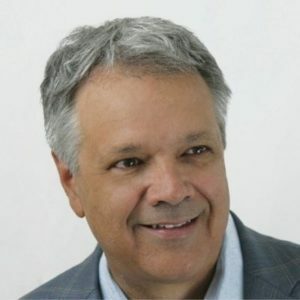 Laustra is venerated as an authority in the space with more than 25 years of experience heading development and strategy for leading companies like Smiths Detection, Astrophysics, and most recently Analogic where Laustra was instrumental in building a U.S. domestic and international market for checkpoint CT technology to make airline passengers safer than ever before. Karsa Oy is developing explosives detection equipment with high sensitivity and specificity to provide dramatically increased explosives detection capabilities at lower costs than current technologies. Bringing this technology to the global market place is expected to transform the security industry with options that will raise the level of security in markets including civil aviation, beginning with air cargo screening. Karsa Oy technology has application for customs and border protection as well as emergency management. For more information about Karsa Oy and its technologies, please visit www.karsa.fi. 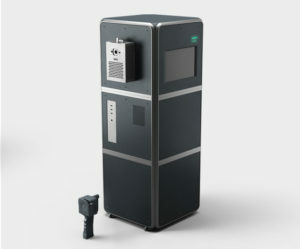 Using technology originally pioneered for ultrasensitive atmospheric trace gas measurements, Karsa is developing explosives detection equipment with very high sensitivity and specificity which will revolutionise the security processes in civil aviation, being more reliable and cost efficient than current approaches. Karsa’s ScentHound platform uses a proprietary version of Atmospheric Pressure Chemical Ionisation Mass Spectrometry and will be initially targeting air cargo screening for explosives. Karsa envisions to deploy its ultrasensitive chemical threat detection technology into all areas of homeland security, including civil aviation, customs and border patrol, and emergency management. Karsa Oy was founded in 2016 by a team of sampling and detection experts from the University of Helsinki, international industry partners and Lifeline Ventures, the leading venture capital investor in Finland, and with the support of the Business Finland, the Finnish Agency for Innovation. For more information, please visit www.karsa.fi. Helsinki, Finland. – September 14, 2018– Karsa Oy (“Karsa”), a Finnish technology firm, announced today it has won the Cargo Challenge Experience, a technology competition sponsored by Bedek Commercial Aviation, a division of Israel Aerospace Industries (IAI). Karsa will join Bedek’s HANGAR innovation accelerator lab and receive technical and commercial assistance to introduce Karsa’s ScentHound explosives and contraband detection platform to the global air cargo screening market. Karsa’s ScentHound platform uses a proprietary version of Atmospheric Pressure Chemical Ionisation Mass Spectrometry. Originally developed for atmospheric research, the technology is far more sensitive than other methods or technologies such as Ion Mobility detection, making it a more cost-effective explosives and contraband detection solution than other products. “Participating at HANGAR's program for 2018, will allow BEDEK and IAI to add value to customers, both airlines, air cargo shipping companies and enterprises to shorten lead-time at airports, reducing TAT (Turn Around Time) significantly,” says Zviya Baron, the director of HANGAR. Karsa is preparing to certify the ScentHound platform to the forthcoming European Civil Aviation Commission (ECAC) Explosives Vapour Detection Standard. The company believes by screening air cargo faster, it could save the European air cargo industry approximately €150 million per year, while improving security. Karsa was one of only three firms chosen by Bedek, and the only non-Israeli firm selected. Bedek’s HANGAR innovation laboratory is one of the few accelerators in its field, and the only one in Israel. IAI will make its premises available to allow its physical infrastructures and test aircraft worth tens of million dollars to be used. In addition, it will help in licensing of Karsa’s technology with the Civil Aviation Authority, accessing a fleet of international customers and more. Karsa Oy was founded in 2016 by a team of sampling and detection experts from the University of Helsinki, and with the support of the TEKES, the Finnish Agency for Innovation. For more information, please contact H.J. Jost, CEO, Karsa Oy at hj.jost@karsa.fi or visit www.karsa.fi. IAI Ltd. is Israel’s largest aerospace and defense company and a globally recognized technology and innovation leader, specializing in developing and manufacturing advanced, state-of-the-art systems for air, space, sea, land, cyber and homeland security. Since 1953, the company has provided advanced technology solutions to government and commercial customers worldwide. IAI also designs and manufactures business jets and aerostructures, performs overhaul and maintenance on commercial aircraft and converts passenger aircraft to refueling and cargo configurations. IAI is Israel's leading Aerospace company, with an annoual revenue of $4Bl. Karsa will be at Slush 2018! Please come by our booth D.14 on Wednesday, Dec 5. We look forward to seeing you there and tell you more about detecting threats in all areas of homeland security and specifically civil aviation. CPO Aleksei Shcherbinin presented Karsa's project funded by the UK Defence and Security Accelerator at the demo day in London. A nice write up of the event was recently published in Airport Technology. Karsa was selected in the Finding Explosives Hidden in Electrical Items competition. H.J. Jost on stage presenting Karsa in Tel Aviv. 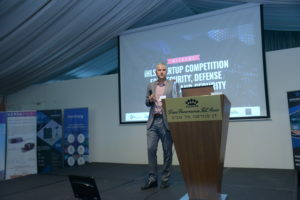 Karsa was presenting at the Security, Defence and Homeland Security Startup Competition on July 11, 2018 in Tel Aviv, Israel. It was an exciting event and interesting opportunity to meet Israeli players in the domain. You win some, you loose some. 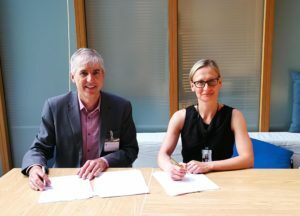 Airmodus Oy and Karsa Oy have reached an agreement to transfer the Chemical Ionisation for Mass Spectrometery (CI) Applications business to Karsa Oy, specifically the A70 product line. Karsa Oy is focused on commercialising CI technology originally developed at the University of Helsinki mostly for security applications and the addition of the A70 product fits well with Karsa’s core CI expertise. “Our team of world leading CI experts is striving to solve the challenging detection problems that our customers face” said H.J. Jost, CEO of Karsa Oy. “The A70 gives us another product to offer to our customers, for example in atmospheric research”. Airmodus Oy is a pioneer in the detection of single digit aerosol nanoparticles, using technology also originally developed at the University of Helsinki. "Our technologies were invented by atmospheric researchers to be used by atmospheric researchers. Our two focus areas have been counting aerosol particles and detecting their gas phase precursors. Now we will focus on widening the customer segments and application areas of our aerosol particle detection technologies. " said Minna Väkevä, CEO of Airmodus. The terms of the deal are not disclosed. Airmodus products enable the detection and monitoring of ultrafine particles and the early stages of aerosol particle formation. Airmodus expertise serves the purposes of atmospheric sciences and aerosol research, as well as any industrial applications where nano sized particles are generated on purpose or as an unwanted by-product. Airmodus particle counters are be used to certify that a vehicle engine follows e.g. the EURO 6 or China 6 requirements, and the Airmodus 1 nm solutions as tools to develop the combustion process of an engine to get rid of particles even smaller that required by the regulations. We at Airmodus are committed to use our aerosol knowhow to help you find the right way to measure the number of submicron aerosol particles. Karsa offers explosives detection solutions with very high sensitivity and specificity which revolutionise the security processes in civil aviation, being more reliable and cost efficient than current approaches. Karsa envisions to deploy its touch-less technology into all areas of aviation security: passenger checkpoints, carry on luggage, checked luggage and cargo. The Karsa innovations can be applied across industries for rapid and ultra-sensitive chemical analysis. Karsa Oy, founded in 2016, is a spin-off company supported by the University of Helsinki, international industry partners and a leading venture capital firm. Karsa in the Airport Shark Tank! We are proud to announce that Karsa has been selected to test our ideas in the Airport Shark Tank that is part of the 17th annual AAAE/TSA/DHS Aviation Security Summit December 5 and 6, 2017 in the Washington DC area. Karsa founders are cruising Slush, participating in roundtables and network. Give us a call if you'd like to meet.